Charise Creates: Playful Little Paper-Pieced Projects & A Give-away! Playful Little Paper-Pieced Projects & A Give-away! Right before Christmas I received the best present. 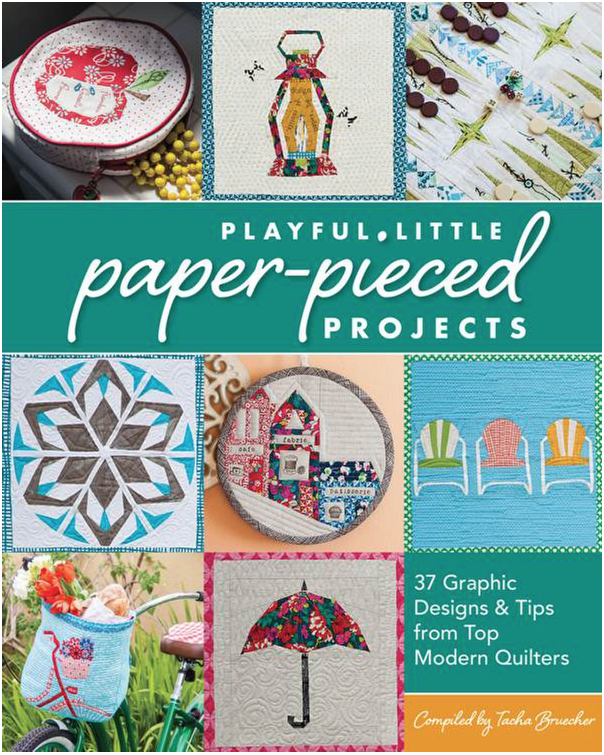 Copies of the book, "Playful Little Paper Pieced Projects" - which I am in! I am so thrilled to be a part of the book. There are so many wonderful projects and talented designers included. Most of the contributors I have met through on-line quilting bees! The book starts with twelve individual paper pieced quilt blocks to make a calendar quilt and a small project that can be made with each block. 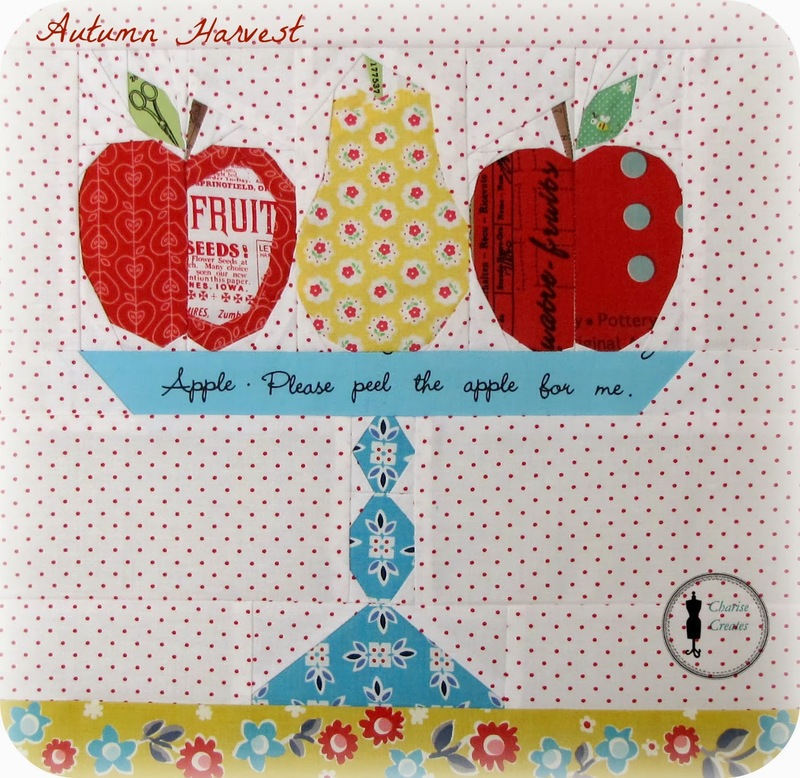 The block I designed is "Autumn Harvest" for September. The top picture is the block before it was added to the quilt and the bottom is the September calendar block completed for the quilt! 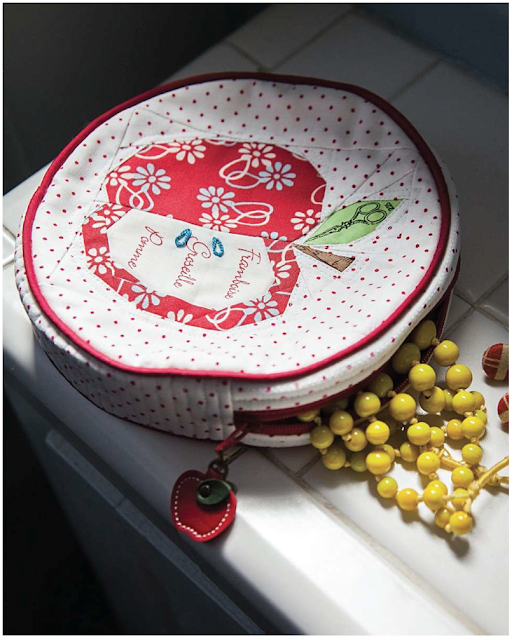 The project that goes with the Autumn Harvest block is my round apple pouch. 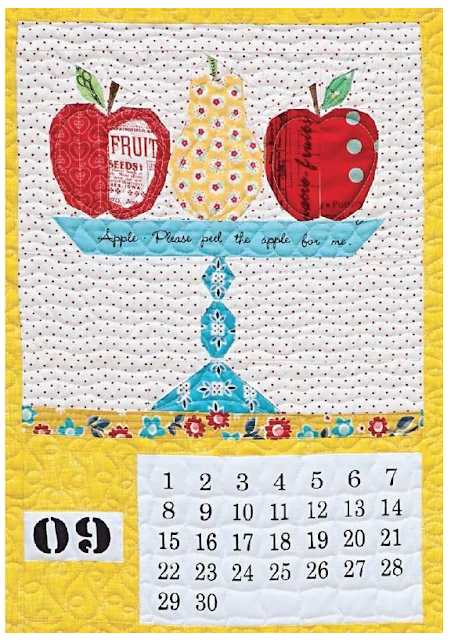 It uses the apples from the calendar block to make a fun pouch that can be used as a makeup bag or is the perfect size for hand sewing projects on the go! There is also a section with small projects for the home. That is where you will find my log cabin Kite Tote! 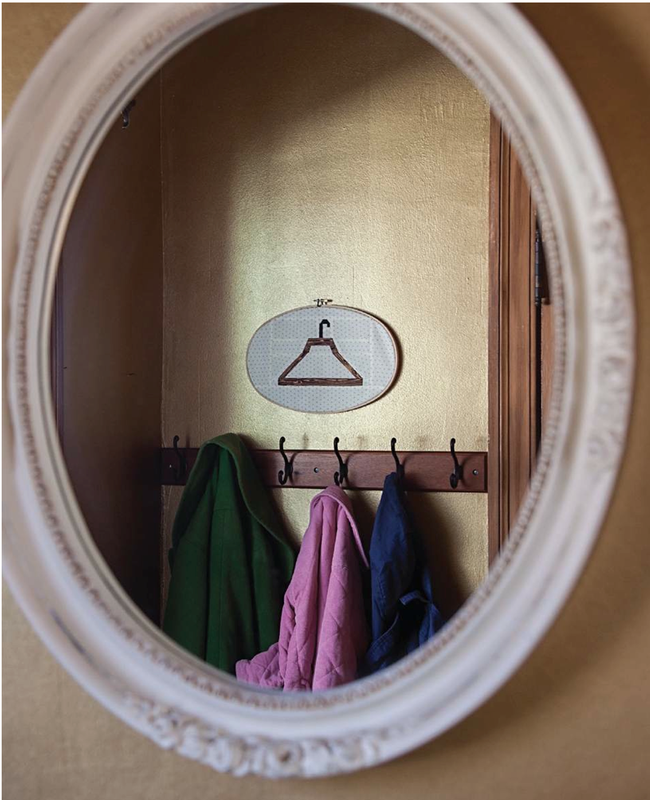 I just love this "hanger wall art" created by Leila. It is so simple and lovely! Can't wait to make one! 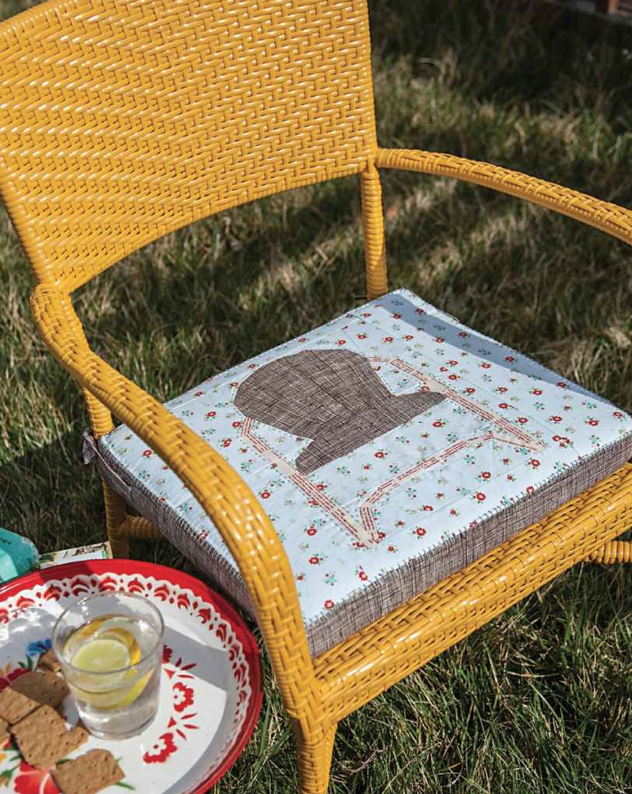 I cannot wait to make these chair cushions for my vintage outdoor chairs! Penny also added adorable stitching to the corners. Such wonderful detail! 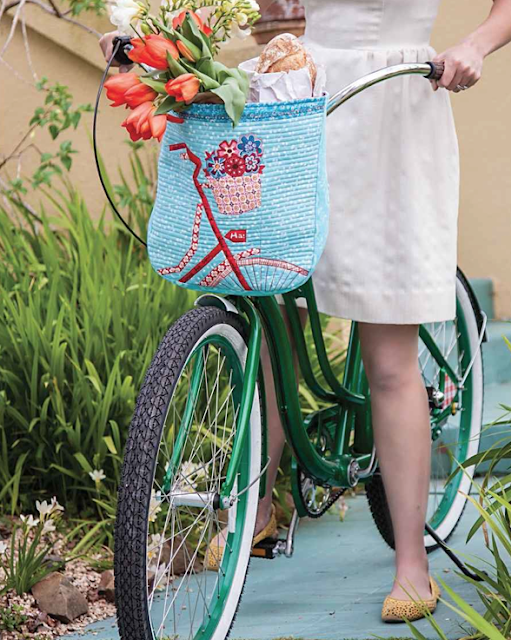 Joanna's bicycle basket is the cutest and it doubles as a tote! Amy's journal cover is just sweet as can be. Kylie's pot holders are adorable and much too cute to ever come in contact with a pot or pan! Lynne's quilt is a stunner. It would look perfect in my living room! U.S. entrants only, please, due to the high cost of shipping. Please leave a comment below sharing any New Year's Resolutions you have made. I will pick a winner on Friday the 10th at 9 p.m PST. oooh! I don't even like paper piecing and I think I have to have that book! Love the Calendar Quilt! Oh I'd love that book. 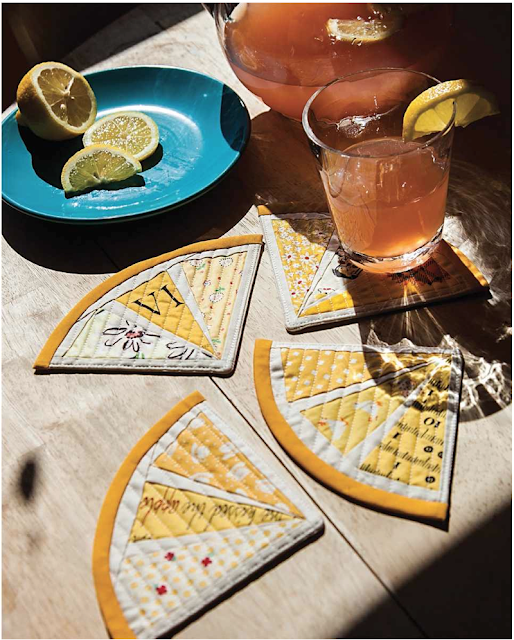 I love paper piecing and would love to have this book. My new years resolution is to spend more time in the Bible! What an adorable book! Fabric organization is in my future for this year's resolution. I really want to learn paper piecing and this book looks very inspirational. I'm doing a RTW fast this year, so I'll need new sewing projects to use up my stash! My resolution is to sew what I want, when I want, without guilt interfering. I see several projects in this book that would fit the bill! I have a huge plan for 2014 with lots of projects @ http://factotum-of-arts.com/2013/12/28/2014-looking-forward/ and I also have a book wish list and this is on the list. Thanks for the give away chance. Pssst, bicycle is Julianna's block ;) (don't yount me in the giveaway of course). I'm so happy and proud to be in the book together with you and all of the designers. You designed really amazing block! I would love a chance to win a copy. My goal for 2014 is just to try be creative more - regardless of the craft. I love paper piecing, and this book has some really terrific projects! My resolution is to sew as much of my fabric as possible (without buying anything new). Thank you for the chance to win! Looks like a fabulous book.... congratulations! I don't make any resolutions.... I feel that it adds pressure and stress and sets me up for failure. I do try to keep positive and accomplish as much as possible. Thanks so much for the giveaway! Congratulations to you on being in such a great book! I make some goals for each year and this year one is to stay more connected w/ family who are out of state and country from us. Thank you! That book looks great! My resolution is to get more exercise and focus on finishing projects without letting them overwhelm me! I would love a copy of this book - thanks for the chance to win. My New Years resolution is to floss my teeth more. Not exciting but my sister is a dentist and it's a habit I want to be better about. 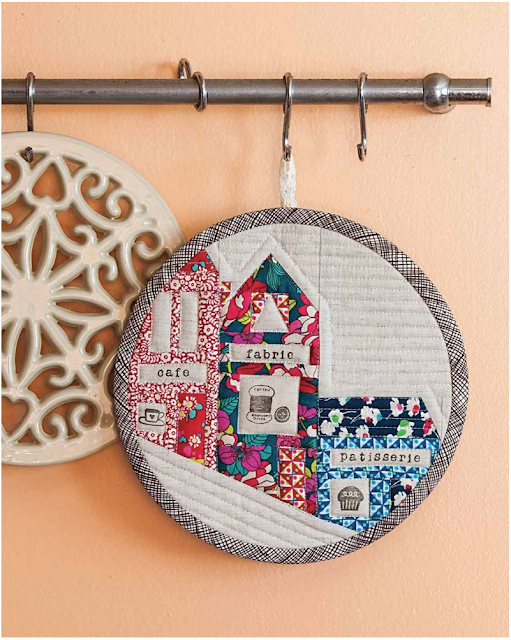 I've written several 2014 sewing/quilting goals, one of which includes starting on the Farmer's Wife Sampler. Oh wow, these look like so much fun, I especially like the bike bag!!! My resolution is to focus on finishing my WIP's. Congrats on the book and thank you for the chance to win one. that calendar quilt is amazing! one resolution i made was to try and use as much as i could of my scrap fabrics...i have too many! i am sure this book would help with that. thanks for the chance to win! So many cute projects in that book! I'll be honest! I don't make resolutions, per se, though I do have some sewing goals. Mainly to finish all the quilt tops I have waiting to be quilted before starting any more. I am already struggling with that! What a great book, I would love to win it!! I have made one resolution I know I'll be able to keep.....buy more fabrics!! Thanks! Just beautiful projects! Would be thrilled! Generally, I resolve to be more mindful. Of what I do with my time, how I shop, and what I eat. I had been making easy or sloppy choices, time to straighten out to do what I would like and need to instead of whims and impulses. My resolution is to finish WIPs - I have so many! Thanks for the giveaway! I have never done paper piecing so getting the book would be awesome! Have to keep learning new techniques!! *grin* Thanks for the giveaway!!! 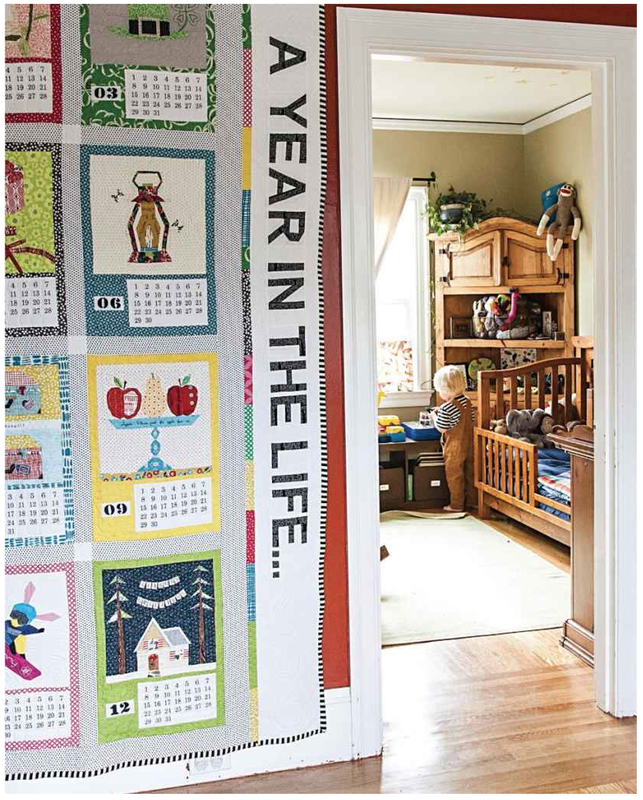 such adorable projects and the year quilt is a knockout. thanks fo rthe chance to win the book. I am not a great lover of PP, but I think I must order that book. That book seems to have a lot of inspiration and so many cool and awesome projects to make. I didn't make any resolutions this year. I do need to get back on the fitness track I was on before the holiday goodies came out, and I'd like to spend more time sewing this year, but I wouldn't consider those resolutions. Thanks for the chance to win this book! My goal for the new year is to work on finishing unfinished projects...and to figure out how to stitch Kumiko Fujita's paper pieced patterns since they have no numbers or directions. Any suggestions? Thanks for sharing this giveaway with us. Blessings. My resolution for 2014 is to learn machine applique, plus continue to finish some more UFOs. Thanks for the chance to win. I love the big clock and the calendar!!! There are several of the smaller projects that are adorable as well.....I would love to have this book.....thank you for the opportunity to win it! Maryam H.
My resolution is to complete at least 6 of my ufo's. The bookhas sew many cute ideas, I would love to have it. My resolutions are a bit conflicted. I want to finish several projects, which obviously requires some work, but I also want to slow down and appreciate the process more. I feel like I'm always buzzing and looking for the next thing and then I don't really appreciate what I'm doing in the moment. One word resoulation this year....BETTER.. I want to be a better friend, a better house eeper and a better and healthyier me. I resolve to win this book! (Kidding...but I do want to challenge myself to make more full-sized quilts this year.) Happy 2014! I would love to make the bicycle basket for my bike....which is part of my new year's resolution: Use what I have already and to be healthier. HAPPY NEW YEAR! What a neat book giveaway! I want to improve m FMQing this year! Thanks for the nice giveaway! My resolution is to complete quilt projects started alst year! Thanks so much for the giveaway -- this book looks so sweet and inspirational! One of my goals this year is to cut back on my fabric spending, limiting myself to just whatever basics (solids mostly) I'll need to complete projects. I can't believe it's only January 4! thanks for the chance to win this cute book. this year, I resolve to have a clean, clutter free house. My resolution is to visit my friend in Japan. Lots of cute patterns/ideas in the book that I like. 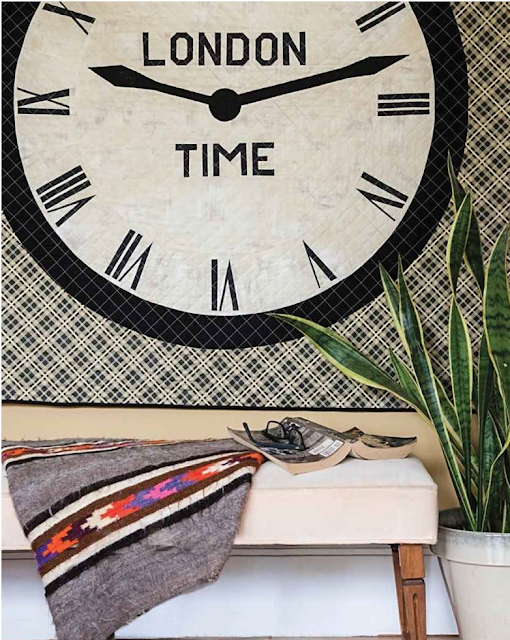 The calendar is fabulous and I love the clock. I know it doesn't sound like much BUT...I resolve to spend at least 1 hour every week practicing my FMQ. I hope to do more than 1 hour and know I need the practice but also don't want to overwhelm myself and find I'm not able to follow through. What a lovely book! This year I want to work on the many projects I have waiting to be finished. How adorable! My resolution for the coming year is to get my "stash" under control. I plan to try some organization ideas I've recently found. 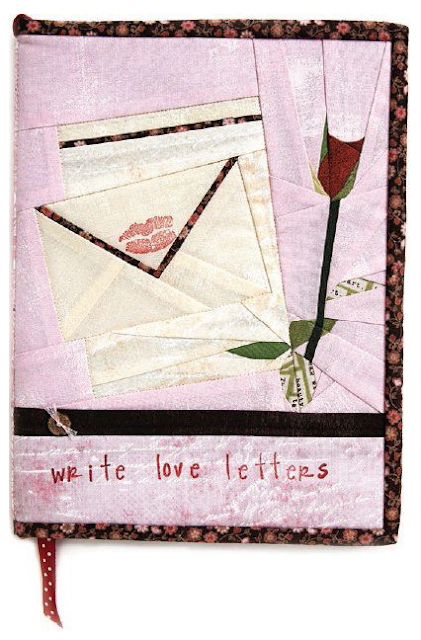 Part of that resolution is to use bits I have and what a great way to use it - in paper piecing adorable projects! My resolution is to complete the MANY quilt tops I have. I am going to try to use the fabrics I have in my stash rather than going out to purchase more. Just hope I can stick to it. I especially love your round apple pouch and the kite tote - so cute! I'm hoping to set aside sewing time for me in 2014. I've always promised myself that I'll get to sew as a reward for getting all the "have-to-do's" done - and I seldom get to actually sew! My biggest goal? ORGANIZE! I started a bit, purged about 8 pieces of clothing (still a bit more to go), went through my emails and deleted the ones I didn't have to think about and flagged the remaining based on category to make it easier to handle. I still have a LOT to do...tons of paperwork, etc. My second goal? Chop and Shop! Thanks for the chance to win! I have never done paper piecing and little projects would be a great way to start! The book looks great. Congratulations! One of my New Year's Resolutions is to sew or work on a sewing project every day. Happy New Year! What cute projects! Thanks for the opportunity to win the book! I love paper piecing and this book is very inspirational. I love those calendars. Thanks for the chance to win it. What a beautiful book. The calendar blocks and all the projects look sew fun. My New Year's Resolution is to work diligently on my sampler king size quilt for our bedroom. Very cute designs! I especially love your kite tote! Every once in a while I take a notion to do some paper piecing, so it would be wonderful to have such cute designs already on hand. What a fun new book! I love to paper piece whenever I find a pattern that inspires me. Hope to use more of my fabric scraps to make new quilts this new year. It does look like a lovely book with great projects. I have a resolution to do about one block worth of sewing a day. Can do more some days and less others and to be generous to myself with praise for what I get done. To that effect I finished the crochet edging around a flannel blanket for my newest great great granddaughter. I also finished 24 of one block and 36 of the alternate block for her baby quilt. She is due in March. My resolution is to be active...physically, creatively, with my family, in my community, etc. I want to be mindful of the life I'm creating for myself on a daily basis. This book looks fabulous. I've recently discovered the joy of small projects and this book looks like it's bursting with great ideas. Thanks for the chance. Looks like a lot of fun projects!!!! I want to be more creative this year!!!! Thanks for the fun give away!!! My New Year's resolution is to complete more quilting & sewing projects. Thanks for the chance to win! How fun, congrats! My NYR is just one word-accomplishment. Your right the hanger is so cute - especially on a clothes basket. NY Resolutions were not happeneing this year for me. As long as I continue to be the best that I can all the way around I'm not heading toward disappointment of not completing the resolution. Thanks for the chance - looks like great projects! Would love this book SO MUCH! My resolution is to start walking again, too dang many excuses! Paper piecing has become a favorite for me ~ would rather do it than anything else (tho I do other things as well). All the projects in the book look so wonderful ~ thanks for the chance to win! My resolution? I really don't have any ~ I have a word for the month tho ~ intention and hopefully what I do this month will carry on for the rest of the year! I love paper piecing - thanks for the chance to win! I don't make resolutions. Therefore, I don't have to feel any guilt if I didn't do them! My resolution is just to embrace life. It is fleeing so quickly. 2014 is my year for completing projects, not starting new ones! HOWEVER... with 10 grandchildren to keep up with, I may have to have this book for some awesome gift ideas. What a sweet group of projects! For 2014, downsize my stuff and keep what I really love. What a great book! I love your contributions. My New Year's resolution is to buy fabric only after I've completed a project. It's my incentive to finish projects and (hopefully) not add too much to my stash this year. What a lovely book, thanks for the chance to win a copy! My resolution is to swap less and create more. My resolution is to use up some of my fabric stash before purchasing any more! This looks like a great book, thanks for the chance! Congrats on being published in what looks to be a must-have book! As for a New Year's resolution, I've got to cut sugar out of my diet! I decided that would be one thing I could work on this year until the donut shop reopened on New Year's Day. Yes, I've already had some of their wonderful blueberry cake donuts. Looks like I'm doomed before I even begin. But, blueberries are good for you...aren't they? My New Year resolution is to sew from my stash for the first six months of this year. I really need a fabric fast. Love the book. ........and my resolution is to finally start on paper piecing and the projects in the book look doable to me so I would love to have a copy! My resolution is, and I must be totally honest and say I made this resolution long before January 1st, to make all the quilt tops I own - and blocks that will be quilt tops - before I start new quilt tops. That's tough but I'm not going to consider the Quilt Alongs I signed up for as quilt tops since they won't be ready until NEXT year to become quilt tops. 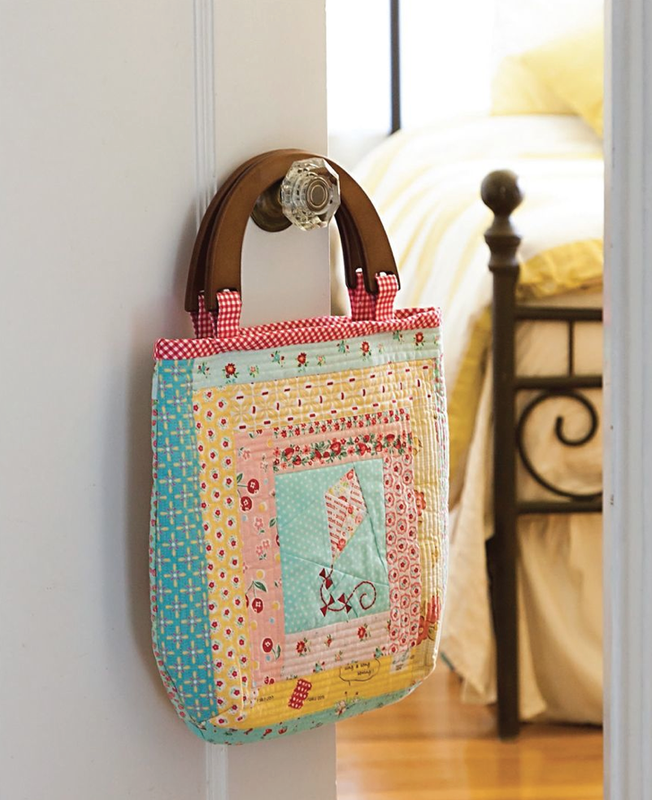 Love the bicycle bag, the potholders; oh, all of them! This book is a must for me as I am addicted to paper-piecing! My resolution is to tidy up my sewing space so I can actually sew! This looks like a great book! I plan to sew more and eat less! Congrats! Looks like a great book. Sorry I missed out because I'm so behind on reading blog posts. Congrats, again! Congratulations on being included in the book!! For the New Year one of my sewing goals is to learn paper piecing! Winning this book would be fabulous!! Hello I have this book and Im finally done with other projects so I can start some from this book! One of the projects I want to make is the apple pouch. One of my favorite things about it is the little Apple zipper pull. Do you know where I can purchase any like it? Thank you!